As a modern rabbi and Justice of the Peace, Rabbi Winer specializes in working with couples who want a wedding ceremony that is meaningful and meets their individual needs. 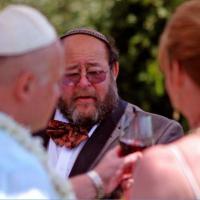 Rabbi Winer believes that his experience as a Justice of the Peace gives him that ability, thereby providing you with a unique ceremony melded in love and made for life. 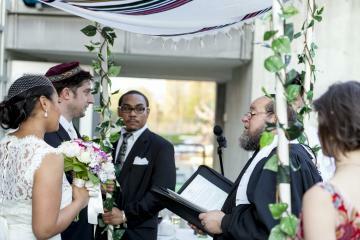 Rabbi Richard Winer considers interfaith wedding ceremonies to be a beautiful bridge of two cultures on both a spiritual and emotional level. For so many brides and grooms, it’s important to stay true to their roots, which is why Rabbi Winer works to incorporate aspects from both heartfelt traditions. 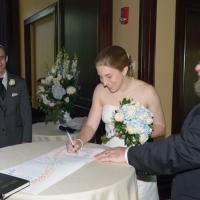 So whether you are looking to have a Jewish wedding or interfaith wedding, Rabbi Winer is open to new ideas and ways of accommodating your wishes. The Jewish ceremony itself is held under the Chuppah, a Hebrew word for âcanopyâ, which can be either stationary and supported by a semi permanent structure or a more traditional canopy held by four people. 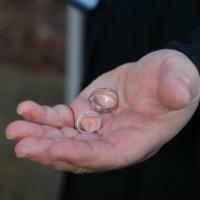 A main part of the wedding is the ring ceremony. According to Jewish law the brideâs ring must be acquired by the groom. 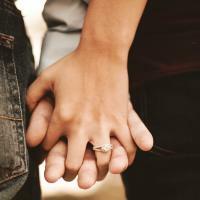 The brideâs acceptance of the ring which the groom places on her left index finger, is the act of legally binding the agreement of the marriage. 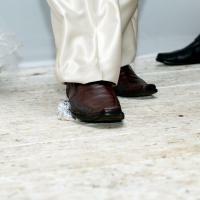 At the end of the wedding (as under the Chuppah) Sheva Brakhot (7 blessings) are chanted. These blessings are part of the Birkat HaMazon (Grace after Meals) said after the meal over a glass of wine. The glass of wine is passed around through the guests to 7 people the couple want to honor and each one says one of the Brakhot (blessings). A loving relationship involves not only sharing the good and happy times, but also s haring the difficult and painful times. May your love for each other never failâ¦but grow deeper and stronger through all of lifeâs varied experiences. Anyone planning to be wed in Massachusetts requires a current marriage license issued by the Commonwealth of Massachusetts whether or not you live within the state. 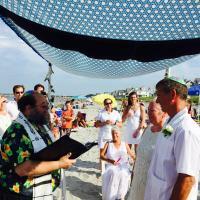 On several occasions, Rabbi Winer has co-officiated weddings with clergy of other faiths providing a unique ceremony that was meaningful to both families. In the end, it’s truly about respecting the expression of love and unity shared between the bride and groom. It is, therefore, important to tailor your ceremony according to what will make you and your loved one happy, first and foremost. It’s not uncommon for some couples to desire no religious traditions during their wedding ceremony. Rabbi Winer is here to listen to what you have to say—no matter what level of religious or spiritual element that entails, and create your individualized ceremony. You’ll find that when looking for any wedding officiant, it’s important to ensure your officiant is able to guide you through a collaborative process where everyone feels heard.